Dec 3 Art Out: Paul Jacobsen "Material Ethereal"
Beginning November 18th and carrying on until December 21st, Signs and Symbols, a gallery on the Lower East Side, is proudly presenting the work of solo artist Paul Jacobsen in his exhibition titled Material Ethereal. The gallery features five of Jacobsen’s small oil paintings, each 14 x 11 inches in size. Jacobsen found inspiration for his paintings from photographs captured in the mid 1950’s by American photographer Walker Evans’ project Beauties of the Common Tool. Evans had originally photographed five extremely commonplace hand tools, including their names and their prices, each item worth no more than three dollars at the time. The five items photographed were a pair of chain-nose pliers, a crate opener, tin snips, a bricklayer’s pointed trowel and an open-end crescent wrench. Evans had been inspired by the ordinariness and inexpensiveness of each tool, as well as the aesthetic appeal present in their curves and simplistic designs. Over 60 years later, Paul Jacobsen has recreated Evan’s photographs in painterly form, adding layers of paint and artistic supplementation, and therefore deeper layers of meaning. Ever the perfectionist, Jacobsen harnesses the effect of realism in his artwork. Although created with brush strokes and oil paint, the images appear to have photographic characteristics, namely the light flairs centered symmetrically from top to bottom on each canvas. The orbs of light give the appearance that a photograph has been taken, a creative tool to which Jacobsen returns again and again in his artwork. Beginning in 2013, Jacobsen has used his method of adding light flairs to paintings, although up until this point, it has always been rendered onto his paintings pertaining to nature, cast down into a shrouded forest den or upon a newly-legalized cannabis plant. Within the positioning of the lens flair on the canvas, poised at the head of each tool, there is a sense of personification of the tools. Even more so, there is an elevated personification, as if the tools hold some level of divinity or sacredness, a deliberate outcome poised by Jacobsen. An exhibit with underlying tones of masculinity and paternity, Jacobsen’s artwork delves into the subject of continuance and carrying on the work of one’s predecessors; an aspect of multiple generations and inheritance. 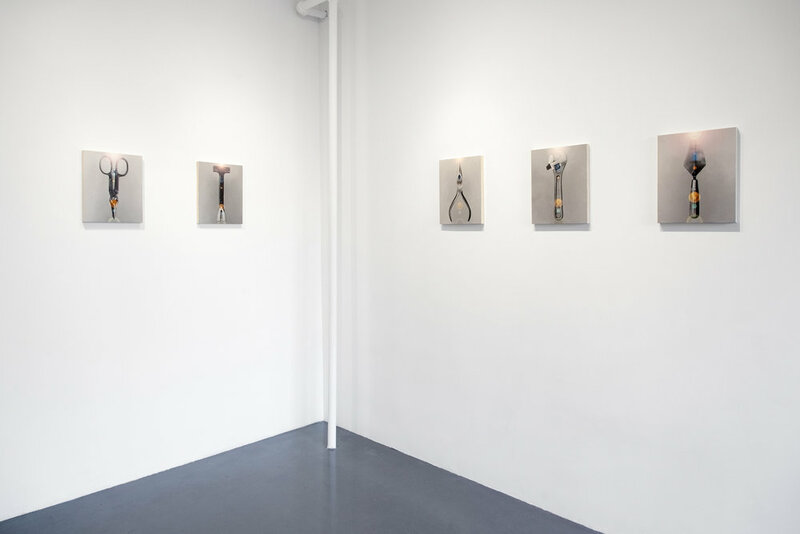 Opposite of the hanging artwork in the gallery are various real-life tools, which, according to Jacobsen, were the possessions of his own recently deceased father. Since his father’s passing, these tools have been passed on to Jacobsen, and the exhibit itself seems to be, in some ways, a dedication to the remembrance of the artist’s late father. As for the title of the exhibit, Jacobsen found deeper meaning even after the initial creation of the tools suspended upon the gray backgrounds of his canvases. The artist found some form of the spiritual and sublime within these commonplace objects. Through personification, the five tools take on an aura of sublime being and there is a recognized separation between the mundane and the celestial, the material and the ethereal.